When it comes to finding new providers to replace those leaving for new opportunities, you know what a challenge it can be. But do you know how much turnover really costs your facility? A staggering seventy-five percent of medical groups don’t quantify the cost of turnover, which means they have no idea how much it can impact their bottom lines. In this article we explore some of the hidden costs facilities face when employees leave. We’ll also reveal how you can reduce turnover at your facility. While it doesn’t seem like a massive cost on the surface, paying for print or online ads, listing jobs with third-party sites like Monster or Indeed, and even promoting job posts on social media can quickly add up. The cost of recruiting and interviewing. On average, it can take up to eight months to get a physician on board, which means months of creating job descriptions, sifting through CVs, calling references, scheduling appointments, conducting phone and in-person interviews, and eventually putting a contract together and extending an offer. The estimated annual recruiting cost for a full-time employee is $61,000. When you lose a physician, you also lose the revenue generated by that physician. This averages average around $990,000 a year. In a recent study, 74 percent of medical groups said they would hire more primary care physicians in the next year than they had the previous year. While you’re waiting to fill gaps, you’re losing millions in revenue you would have otherwise earned. In today’s competitive marketplace, providers have plenty of options. It’s likely you’ll need to cast a wide net to attract top talent to your facility. If you’re not lucky enough to find the right candidate from your local pool, you’ll be paying several thousand dollars to fly physicians to your facility for in-person interviews, and if a doctor accepts your offer, you’ll likely need to cover moving expenses as well. Travel and relocation costs, along with advertising, search agency fees, recruiter costs and employee referral bonuses, make up 90 percent of hiring expenses. Once you’ve hired a physician, it takes time and money to onboard and get him or her up to speed. Training can be costly and keeps other physicians and healthcare providers away from their jobs. It can take up to two years for a new physician to be fully integrated in their job and able to take on the same workload as an established staff member. The average annual start-up cost for a new doctor is $211,000. Survey your employees frequently. You won’t be able to reduce turnover unless you find out why physicians are leaving your hospital. Have candid, one-on-one meetings at least once a quarter to talk about what’s going well and what you both could improve on, and administer online surveys to see what your staff likes and dislikes about their work. Hire the right people. If you’re losing a lot of doctors and seeing lower morale among employees, you may need to look at the types of people you’ve hired recently. Do their values align with your organization’s values? Are they team players and willing to pitch in when needed? Do their personalities fit your company culture? Start asking behavioral questions as well as skill-based questions to find the right candidates. Make your current employees feel valued. When is the last time you wrote a hand-written thank-you card to one of your physicians or thanked her in person for a job well done? Showing gratitude is a simple way to show staff members you appreciate them, as is occasionally bringing in lunch or dinner, showing interest in their life outside of work, and making time to talk with them regularly. While employee turnover can be costly, following these simple steps can help you reduce it and maintain the great staff members you already have. 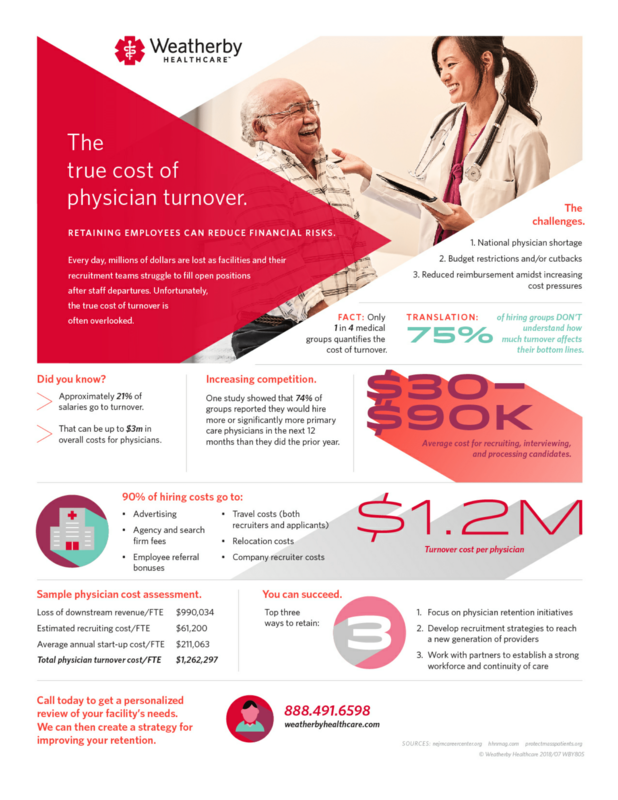 Learn more about the costs of physician turnover in the infographic below—or download a PDF version.